Why is there a need after only 5 years of use, for OIS to be replaced by the new Starlock interface system? Well, if we take a look at the problems of today, and look toward the future of power tools, we can see that OIS was just not going to work out in the long run. OIS was a step in the right direction that united most Oscillating Multi-Tool Manufacturers on a single accessory interface, and as I wrote back in 2010, it could do to OMT's what the T-shank blade design did to standardize the Jigsaw market. The OIS system did just what it was expected to do; most manufacturers jumped on board and adopted the standard and we all lived happily ever after, right? Almost. Fein was the one major holdouts that decided to stick with their original system, which left the accessory market still fractured. Sure, you could swap blades between systems with adapters, but who wanted to deal with such things? I know I didn't. Still most of the other manufacturers were on board and have been using OIS for years, so why make the change now? Simple, the tools are more powerful than ever and OIS couldn't keep up with the torque. It surprised me when I looked down at my Bosch Multi-Tool one day and noticed that some of the pins that hold the OIS blade were missing. I am not sure if it was torque that caused them to shear, but with even stronger tools sure to come out in the future, OIS could not last. 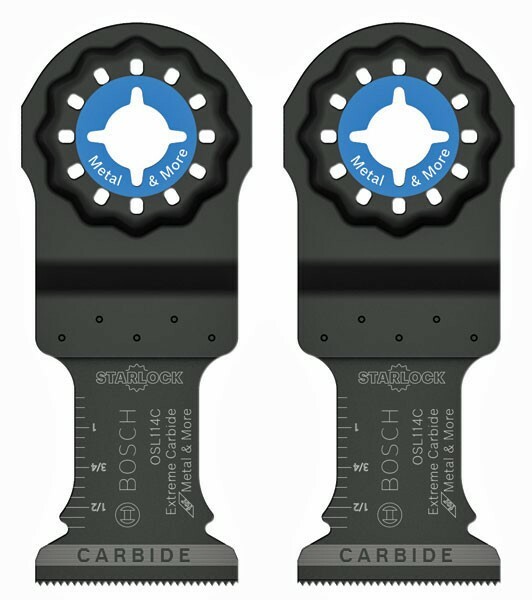 With all that said, Starlock and StarlockMax are the solutions that Bosch and Fein came up with to hopefully future proof the interface system for Oscillating Multi-tools. 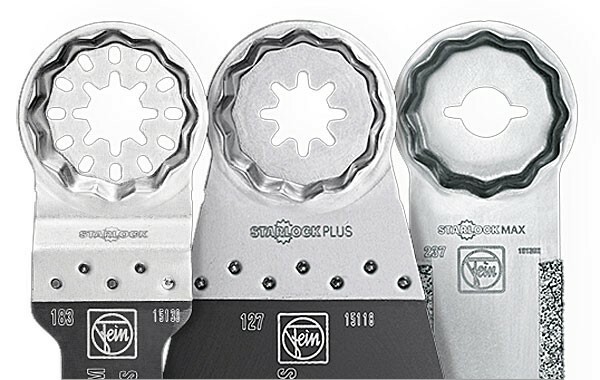 StarlockMax will come on tools designed to handle big blades that require more torque, and Starlock will be used for everything else. 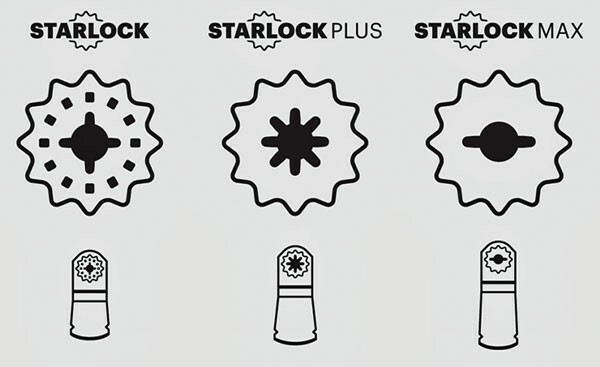 StarlockMax tools will be able to use the lower Starlock accessories, but to protect Starlock tools from damaging themselves, they will not be able to accept StarlockMax accessories. The concept is similar to the SDS system used for rotary hammers. Limitations built into the accessories should prevent users from using an accessory that requires a lot of torque on a tool that can't provide it. If you will notice, Starlock is basically a combination of the two companies designs, with the added aspect of being three-dimensional (like a bottle cap) instead of flat. 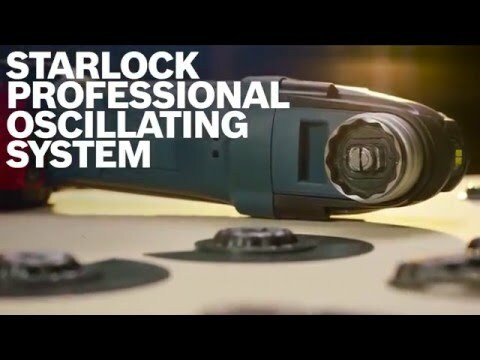 This means that Starlock is still backward compatible with the Bosch OIS system, and I believe StarlockMax is backward compatible with Fein SuperCut accessories. Initial reports also mentioned a StarlockPlus interface, but the official press release from Bosch makes no mention of it. It seems to be unnecessary to have another interface between the two, so it might have been dropped from their original plans. It is backward compatible with older Fein MultiMaster tools, but so is Starlock. Additionally, new Bosch Oscillating Tools that use the Starlock Interface System will feature a no-touch quick change Snap-In system that provides auto-ejection and blade changes that take only seconds. Bosch will also color code their blades to make them easier to identify: White for all-purpose applications, Gray for wood and laminate applications, Blue for cutting metal and other tough materials, Purple for soft materials, and Brown is for grout removal and abrasive applications. Launching this month from Bosch will be a range of 30 Starlock blades. Coming in April 2016, they will offer 10 StarlockMax blades, and that is when they also expect to launch their new line of Starlock Multi-Tools. It looks like Fein is also coming out with new tools at about the same time in Europe. Perform to a new standard, with the NEW Bosch Starlock Professional Oscillating System.